I am on holiday in Virginia. I thought I would tell you that in case you want to stalk me. Just kidding. Please don’t stalk me. I had a grand idea that I would take lots of pictures on my droid and then post them. But I only took a few pictures and they’re all pretty lame. That’s the time I got up on Christmas morning. 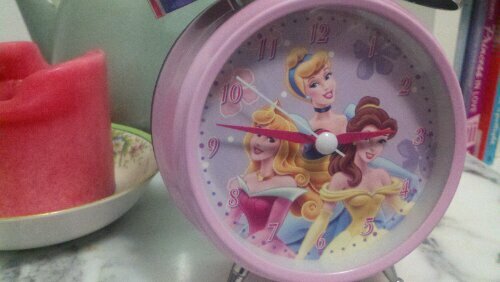 Yes I have a disney princess alarm clock. Santa was fully intending to get me a new one for Christmas but we all got up too early so he didn’t have time. 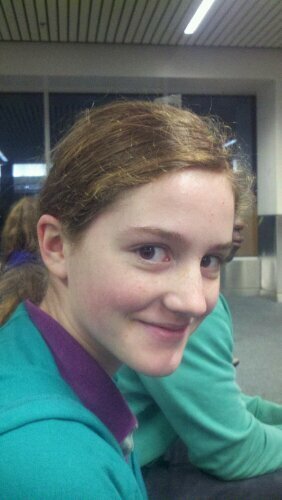 Jenny in the airport. Notice how we drove two hours to Portland and took a shuttle to the airport and went through security and it’s STILL dark outside. 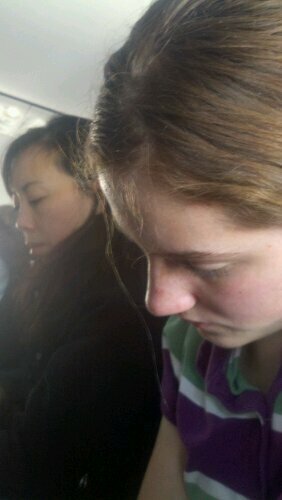 Jenny in the airplane. I don’t know who that other lady is. I doctored up the sky mall catalog. 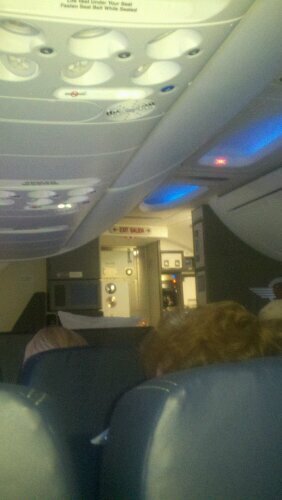 There were two flights, and a normal looking middle aged lady sat by me for the second. 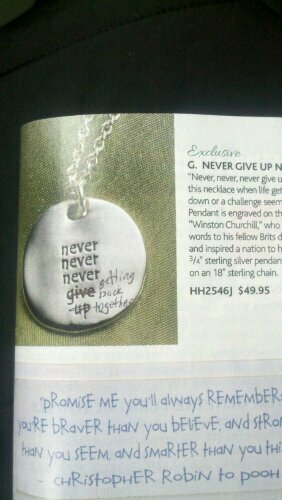 For some reason she and I went through the sky mall catalog together and hooted and laughed at the things you could buy. Like a life-size yeti statue for your garden. See the snow outside the window? I guess that sort of counts as having a white Christmas. But in reality my Christmas looked like this. I took a mug with me, because I always take a mug with me. For tea and stuff. But it broke so I had to throw it away at the DC airport. 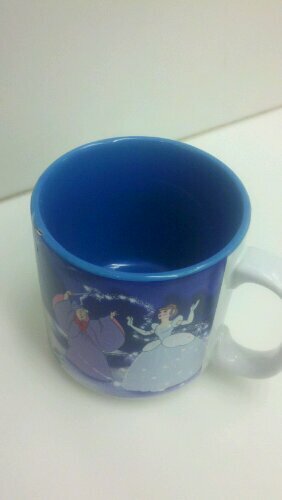 Yes, it was a Cinderella mug. Any more questions? I was very sad about my mug but decided to have a new year’s resolution to become less attached to stuff. Well then. Once I was in a beautiful cabin in the woods of Virginia with my entire family, and hearing fascinating stories of living in Toronto and DC and at SMBI, I forgot about taking pictures. 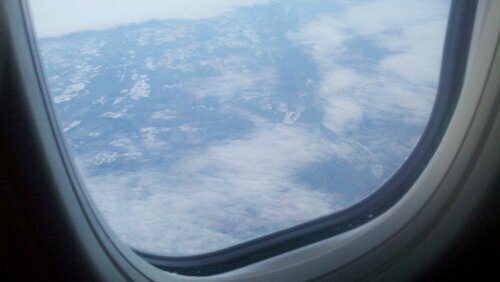 So you’ll have to be content with shots of Disney princess paraphernalia and mid-flight boringness. Hey Emily, me and my mom, met your mom today, at the book signing… t’was special indeed. hahaha I love the clock 🙂 I find irony in the fact that the only thing you don’t have is a pair of red rubber boots…considering the name of your blog and all.